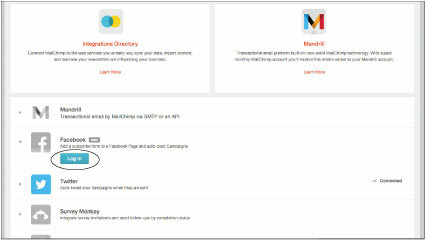 Locate the integration feature in your Mailchimp account. 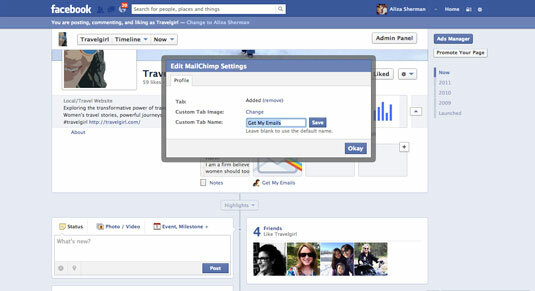 Locate the section in your e-mail marketing service, such as Mailchimp, where you can connect that program with your Facebook Page. 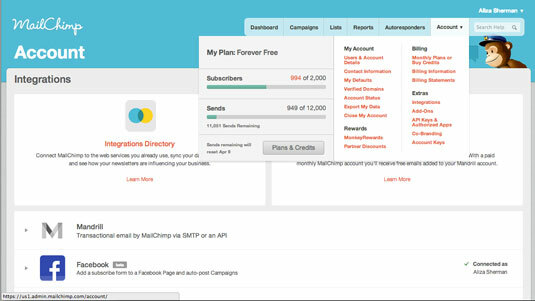 In Mailchimp, click the Account tab at the upper-left corner of your account page and choose Integrations. 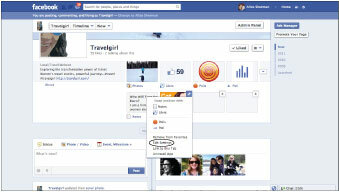 Log into your Facebook account from Mailchimp. 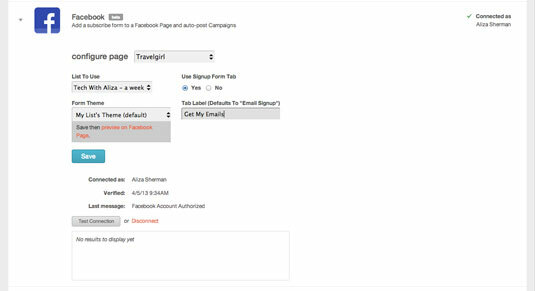 Click the Log In button to connect to your Mailchimp account to your Facebook account. Facebook should confirm the connection, and you’ll be brought back to the Mailchimp Integrations page. Configure the e-mail app connection. 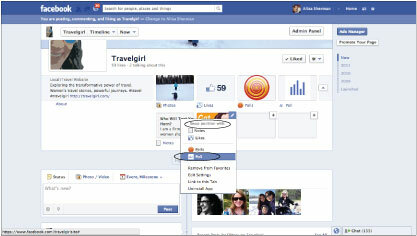 Select the Facebook Page where you’d like to add the e-mail app; then select the List to Use or your Mailchimp e-mail list. Choose Yes under Use Signup Form Tab because that adds the actual app to your Page. Choose your Form Theme or design from Mailchimp. You can change the Tab Label from Email Signup to another short action statement if you’d like. Click Save. Go to your Facebook Page and open your apps. 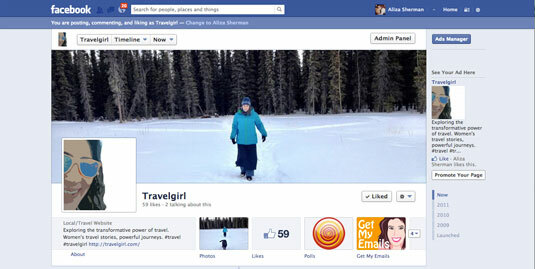 Your Facebook Page apps are located directly beneath your Page’s cover image. Click the upside-down triangle to the far right of your apps to enter the app editing mode. Doing this also reveals any hidden apps you’ve added. You will see that the Mailchimp app has been added to your apps. In Edit mode, open the editing menu for any app by hovering over it and then clicking the tiny pencil that appears. In the menu that appears, click Edit Settings. You can edit the action words inviting people to subscribe to your newsletter and swap out the Custom Tab Image for something branded. The image for a Facebook app must be 111 x 74 pixels. 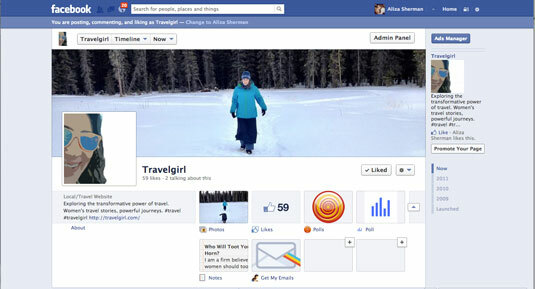 Click on the image you want to change, find an image on your computer sized to the proper dimensions, and then upload it to Facebook. Click Okay to accept your changes, and your Mailchimp e-mail app image will appear with the new look. Move the app to a top position. Only the first four apps are visible to your fans on your Facebook Page so swap places between the new Mailchimp app and an app you can hide. Go back to the editing menu and choose Swap Position With and select the app you’d like to replace. Verify your app is visible. 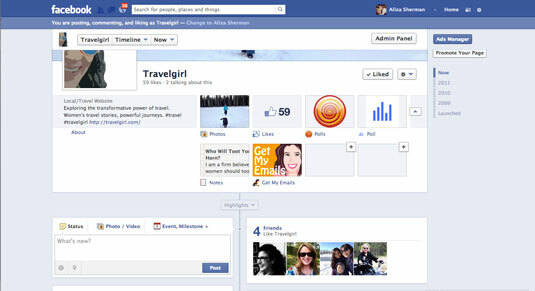 Close the apps section to see what the public sees when they arrive at your Page. Confirm that your new app with its new look is in a prominent position to encourage e-mail signups.